Citation: Popov M. Wrongly interpreted icteric syndrome in outpatient practice. J Microbiol Biotechnol Rep. 2018;2(3): 54-55. The icterus is the yellow coloration of the skin and the visible mucous membranes due to the deposition of bilirubin in them. It usually occurs with an increase in blood bilirubin to more than 30 μmol/l . The icteric syndrome is highly suggestive of many diseases, but is most often seen in infectious diseases affecting the liver. For this reason, ambulatory clinicians often disregard other possible causes for increased bilirubin formation and target the diagnosis of acute viral hepatitis . This is followed by a delay in the actual diagnosis and often placing the patient in an infectious station where he might be exposed to other contagious pathogens. A 36-year-old man who has visited his family doctor for fainting, lack of appetite and slightly yellowing of sclerotic layer and skin. In the review, the physician detected the presence of icteric syndrome and, through palpation, felt enlarged and slightly painful liver. Without further investigation, the patient was diagnosed with acute viral hepatitis and directed for treatment to our clinic. During the review, we also found a discreet jaundice and an enlarged liver about 3 cm below the ribbed arc. In the blood tests, it was found that the patient had only elevated liver enzymes – ASAT 86 U/I and ALAT 115 U/I when the normal rate is 45 U/I for both enzymes. This gave us reason to doubt the preliminary diagnosis, as acute viral hepatitis usually runs with tenfold increase in enzymes. 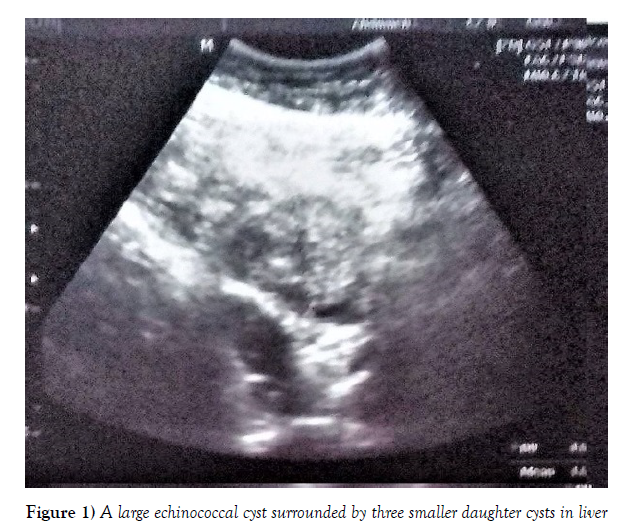 From the abdominal ultrasound, in the right liver lobe, there was a large echinococcal cyst surrounded by three smaller daughter cysts (Figure 1). Serological markers for viral hepatitis were negative. Preoperative treatment with Albendazole was initiated and the patient was directed to a surgical clinic for surgical treatment . A woman at the age of 83 visits her doctor with complaints of fever, abdominal pain and two vomitings. Two days after the onset of complaints noticed yellowing of the skin. Without laboratory tests, the patient was directed to our unit with suspicion of acute viral hepatitis. The examination showed an intense jaundice, the stomach was very painful, the liver did not feel enlarged. From the blood tests performed, the liver enzymes were normal, but there were signs of inflammation – 28 × 109/L, CRP 112. Acute viral hepatitis rarely occurs with fever and vomiting, mainly in children. Strong abdominal pain and severe inflammatory changes in the blood picture are incompatible with the diagnosis. 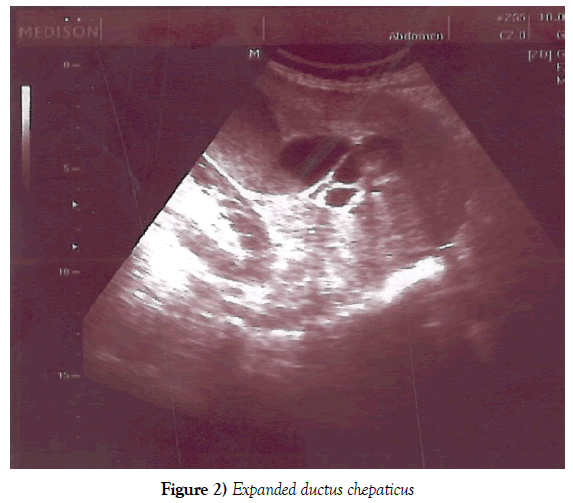 The abdominal ultrasound was found to have reliable data on expanded extrahepatic bile ducts – the ductus chepaticus was the size of the vena porta forming the “double-barelled gun symptom” (Figure 2). The patient was directed to a surgical ward, where acute induced pancreatitis was diagnosed and underwent surgical treatment. A 41-year-old woman visiting her doctor for light abdominal pain, nausea and a slight yellowing of the skin. When blood samples were tested, no other abnormalities except the slightly elevated liver enzymes ASAT 66 U/I and ALAT 75 U/I were detected, when the normal rate is 45 U/I for the both enzymes. Despite the discreet increase in enzymes, the physician takes the preliminary diagnosis of acute viral hepatitis and directs the patient to our clinic without further investigation. We found the same objective circumstances, but in palpation the liver was very painful. 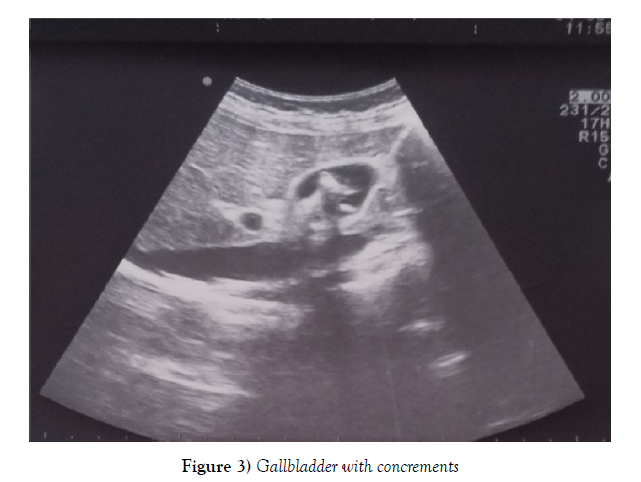 Serological tests for viral hepatitis were negative, and abdominal echocardiography observed the typical pattern of gallbladder almost full wirh cholesterol-containing concrements, most of them at an advanced stage of calcium conversion (Figure 3). We directed the patient to a gastroenterologist and surgeon for further refinement and treatment. The cases we have described indicate that the icterus is often a symptom of a disease other than viral hepatitis, and the premature placement of “popular diagnoses” leads to the wrong path of the patient in the health services maze. We recommend increasing the tendency to use laboratory and instrumental methods of diagnosis in outpatient practice. With our clinical cases, we demonstrate the great possibilities of safe and convenient ultrasound diagnosis [4,5]. It is an indispensable method for identifying diseases localized in the abdominal cavity and most superficial structures. Stiefelhagen P. Patient with icterus: how do you find the diagnosis? MMW Fortschr Med. 2015;157(15):52-5. Hofmeister MG, Foster MA, Teshale EH. Epidemiology and Transmission of Hepatitis A Virus and Hepatitis E Virus Infections in the United States. Cold Spring Harb Perspect Med. 2018. Tamarozzi F, Akhan O, Cretu CM, et al. Prevalence of abdominal cystic echinococcosis in rural Bulgaria Romani and Turkey: a cross-sectional ultrasound-based, population study from the HERACLES project. Lancet Infect Dis. 2018;18(7):769-778. Velev V, Tolekova N, Naidenova N, et al. Acalculous cholecystitis in a child in the course of Salmonella gastroenteritis. Clinical case with a review of the literature. Pediatric Infect Dis. 2018;3:59. Esquerrà M, Roura Poch P, Masat Ticó T, et al. Cruxent R. Abdominal ultrasound: a diagnostic tool within the reach of general practitioners. Aten Primaria. 2012;44(10):576-83.